Ultraviolet water purification uses ultraviolet (UV) rays to penetrate the harmful pathogens in your home’s drinking water. Ultraviolet light is invisible but we are exposed to it every day from all sources including the earth’s sun. Ultraviolet water purification is a simple but effective process that destroys around 99.99% of the harmful organisms in water. Aside from drinking water at homes, it is also used in untreated private water systems such as when camping. UV water purification is usually done in conjunction with other forms of filtration such as reverse osmosis or carbon block. There are three recognized types of UV light. Long-wave UV light has the least germicidal value and has a wavelength range of 3250 to 3900 Angstrom Unit (A). Middle-wave UV light is the one found in sunlight and ranges from 2950 to 3250. It is known for its tanning effect and provides more germicidal action than the long-wave UV light. Short-wave UV light is the type commonly used in water purification. It has the greatest germicidal effect and destroys almost all types of pathogens; bacteria, fungi, molds, spores and viruses. Its wavelength range is 2000 to 2950 A. However, short-wave UV light does not naturally occur in the earth’s surfaces because of the atmospheric protection from sunlight radiation below 2950 A. To utilize this type of UV light for water purification, a mercury vapor lamp is needed to convert electrical energy to short-wave UV light energy. The mercury vapor lamp, also known as germicidal lamp, is considered the most cost-effective source of short-wave UV light. These lamps are made out of special quartz glass that usually permits short UV rays to pass through. Because of the low pressure inside the lamp, it can emit radiation that is around 2537 A. Within this range, maximum germicidal effectiveness is achieved. An electric arc is needed to produce heat enough to vaporize the small amount of mercury inside the lamp. The vaporized mercury becomes ionized which in turn gives off the short-wave UV radiation. It is important that water to be purified through UV radiation should be clear enough to allow the penetration of UV light. Turbid water should be filtered first to allow UV light penetration at its maximum effect. Most purification water systems use a 5-micron filter before using the mercury vapor lamp. 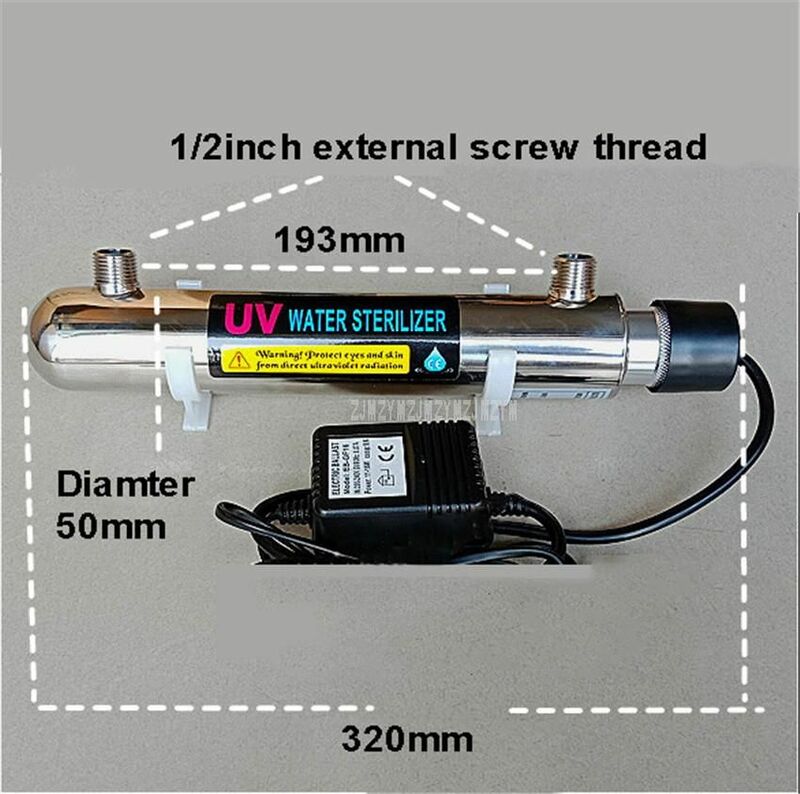 UV water purification is affordable and effective at the same time. It only requires the same amount of energy as when you turn on a 60 watt light bulb. Chemicals are not introduced into the water so this lessens the possibility of chemicals posing harm to the human body. UV rays do not also damage septic tank and plumbing systems. In order for the water purification to really work, you need pre-filtration techniques to remove sediments that may hinder the UV light from penetrating the water. Electricity is also required to run the mercury vapor lamp. This may not work in third world countries with frequent electricity shortages or in the outback during backpacking trips, for example. There are, however, UV pens made specifically for the portability required in such situations. The lamps need replacement once a year to ensure peak performance and effectiveness. They have in stock at the big Ace Hardware at SM City. Was looking directly at them.. while looking for water filter in same area. Didn't see if they also sold replacement lamps.. which sounds like clear requirement. Ace buys there water treatment stuff including UV, softeners, and filters from Hi-Q in Lilo-an. You can go there and buy wholesale for about 1/3rd the price at Ace. They can probably also hook you up with an installer if you need that. I brought my RO system over from AU - but added the UV locally. The best bet seeing as the UV bulb degrades and needs replacing to maintain effectiveness. One size does not fit all. Hi-Q have a few branches around Cebu - some more knowledgeable than others I have found. Filters they are great with, fittings not so much. Same goes for ACE - they sell kits but not a lot of accessories. Getting the anti-scalant balls for the RO to slow/stop the clogging from the excess of minerals in the water here was quite a search also - but worth the effort to prolong the RO membrane life. is yours a home system or commercial?